John Brown University’s lunabotics team, the “Eaglenauts,” placed fourth overall at NASA’s third annual Lunabotics Competition held last week in Florida. The team brought home awards for second in “Systems Engineering Paper” category, third in the “Outreach Award” category and fourth in the “Lunar Dirt Mining” category. Nearly 60 teams from around the world registered for the competition at Kennedy Space Center. JBU students spent the 2011-12 school year designing, building and testing the robot for the competition. The remote controlled or autonomous excavator was required to deposit a minimum of 10 kilograms of lunar simulant within a 10 minutes head-to-head competition. The lunabot also needed to withstand the abrasive characteristics of the lunar environment, adhere to the weight and size limitations of the lunabot required by NASA and have the ability to be controlled from an off-site location. Some of the concepts created by the team could possibly be incorporated into the design of future NASA robots. The Lunabotics Mining Competition is a university-level competition designed to engage and retain students in science, technology, engineering and mathematics (STEM).Through this competition, NASA is exposed to innovative lunar excavation concepts from STEM students that could ultimately be applied to actual lunar excavation devices. In preparation for the trip to Florida, the team took the robot to local schools to demonstrate and test its capabilities. 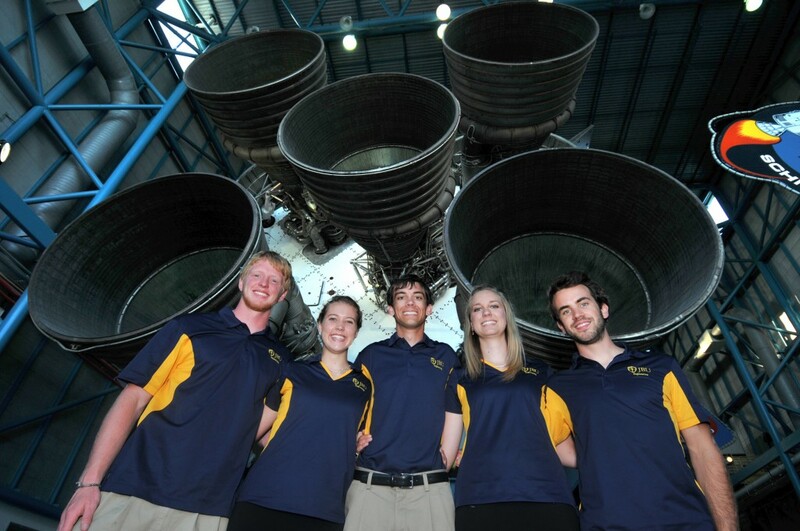 This is the third year that JBU has participated in the NASA Lunabotics Competition. Funding for the lunabot was provided by Arkansas Space Grant Consortium, NASA, Nance Machine, Macro Industries, SAEF Finishing and JBU. John Brown University is a private Christian university, ranked first among Southern regional colleges by U.S. News & World Report and is listed as one of America’s Best Colleges by Forbes. JBU enrolls more than 2,100 students from 41 states and 44 countries. JBU is a member of the council for Christian Colleges and Universities. Pictured left to right: “Eaglenauts” team members Jesse Van Gorkom, Bethany Miller, Travis Reimer, Lindy Roberts and Jacob Pinkerton at the awards ceremony held in the Apollo/Saturn V Center at NASA.